"One day (what will have happened? ), a far-seer will abandon his or her segment and start walking across a narrow overpass above the dark abyss, will break his or her telescope and depart on a line of flight to meet a blind Double approaching from the other side." "By repetition you can increase the chance that your choice will sound as far as the borders of the network, but you also risk toppling over the landscape (previously filled with surprises) into a monotonous desert." Annie Abrahams (from the Living Room in Montpellier, France) and Curt Cloninger (from Black Mountain College Museum and Arts Center in Asheville, North Carolina, US) repeatedly sang "love, love, love" (a short excerpt from a pop song*) as a kind of duet, in real time/space and online. In order to isolate them from their surroundings and make them more attentive to the other, they were both blindfolded. While singing they evolved and mutated the original song excerpt, collaborating and communicating in a space/time of alterity. The artists have never met each other in the flesh. There was no set duration. They sang until the last one of them decided to stop. In both places a space was reserved for the live performance and another for the video and audio projection. A camera was fixed on each of their faces singing to each other. 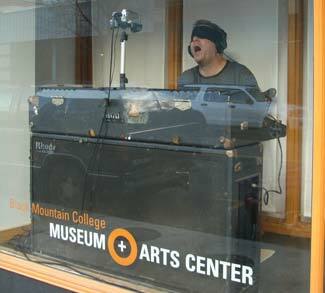 This live video of both faces was projected both in the Living Room space and in the Black Mountain College Museum and Arts Center space. The performance was also visible on the web at http://selfworld.net. * U2's Until the End of the World.